How often are you rushed in the morning and end up skipping breakfast or grabbing something not-so-heathy on the run? This can lead to energy drops or being over hungry for lunch. Want a quick and healthy breakfast that you can grab on the way out the door? Try overnight oats! Overnight oats are super trendy right now. 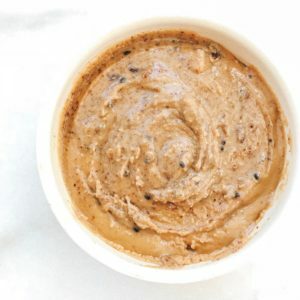 Read my nutrition student, Catherine Fischer’s, guest blog post on how to make overnight oats and some really fun (and nutritious) recipes! For many people, breakfast is the most important meal of the day. A nutritious and well-balanced breakfast keeps you feeling energized, prevents blood sugar spikes and can help ward off cravings later in the day. 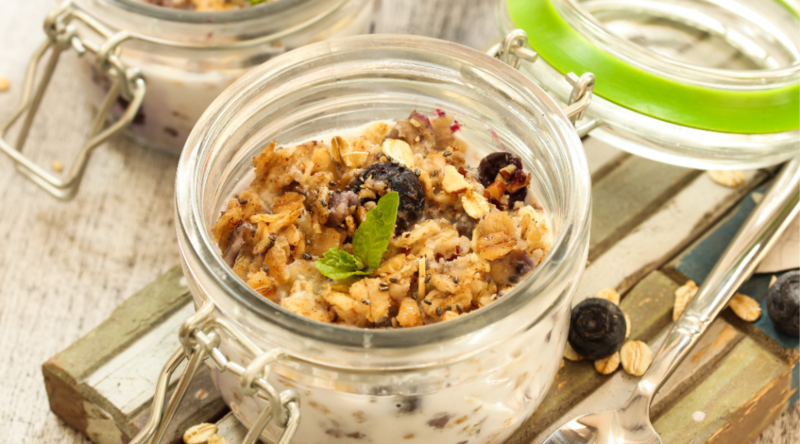 Overnight oats fits the bill! Add in nuts, nut butter and/or Greek yogurt as well as another fiber source to bump up the staying power of oats even more! Oats contain carbohydrates, protein and fiber. They’re a rich source of beta-glucan, a viscous soluble fiber that has shown to lower LDL cholesterol. 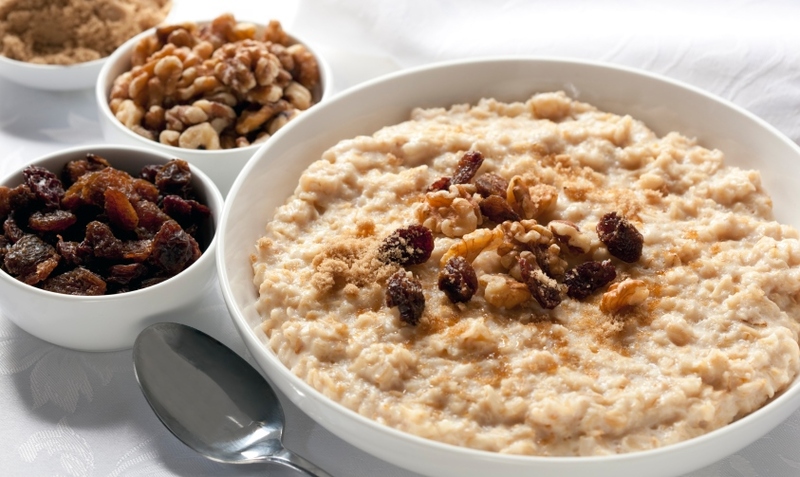 (Martha’s note: I’ve had many patients lower their cholesterol by adding in oatmeal + flaxseeds as a breakfast) Due to their low glycemic index, it won’t result in blood sugar spikes and crashes – as long as you don’t load it up with brown sugar and raisins! – Versatile. I am pretty sure you could make a different combination of overnight oats every day for a year and never have to use the same recipe twice. 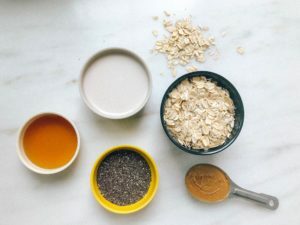 There are so many options, starting with the type of oats you use, to the numerous bases you can use to soak your oats, and lastly, the best part in my opinion, toppings. Options for toppings are endless! And if you don’t like them cold, you can reheat them in the microwave. – Great source of prebiotic fiber. Uncooked oats have 37 times more prebiotic resistant starch than cooked oats. (reference Kara Landau RD) Prebiotics are essential for healthy gut bacteria. So if you really want to keep the prebiotic fiber high, don’t heat the overnight oats in the microwave! – Saves time. You don’t have to cook them! Let the refrigerator do the work. Overnight oats can be prepared up to 5 days in advance and only take 5 minutes (if that) to prepare – pretty convenient right? – Rolled oats are the most common oats used for overnight oat recipes. They lend a more favorable texture and do not result in as mushy of a consistency as other oat variation. They have a higher fiber content compared to instant and quick oats. – Quick cooking oats: Although similar, quick oats are more processed and are thus thinner and would result in a much mushier consistency than rolled oats. They probably won’t keep you feeling full as long as the other types of oats. – Steel cut. While they’re a great option for making warm oatmeal, they don’t digest as well raw. So many people find them the least favorable option for overnight oats. But they do have a nutty flavor and are the least processed type of oat. You can always give them a try and see what you think! 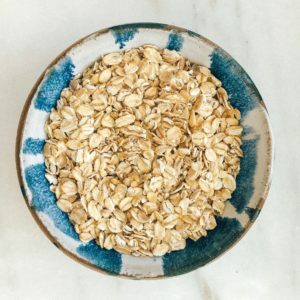 – Muesliis a great option for overnight oat. It’s typically composed of rolled oats with the addition of nuts, seeds, grains, etc.My personal fav are rolled oats! I love the consistency and texture it provides the best, it’s so creamy. – Milk (dairy or non-dairy): Great to use if you like a creamier and more flavorful base.You can also use non-dairy milks including coconut milk and almond/cashew milk. 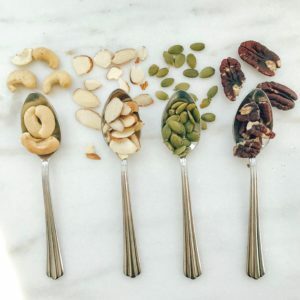 Check out Martha’s post on milk and non-dairy milk alternatives for options on different milks and nutritional content. – Yogurt: For an even richer and extra creamy texture, use yogurt or coconut cream as your base and add a little bit of water to thin it out. Greek yogurt contains the most protein. Tip: If you like a very thick consistency, add less milk to your overnight oats. If you like a creamier consistency, add more milk. What seeds should you use to absorb your liquid base? 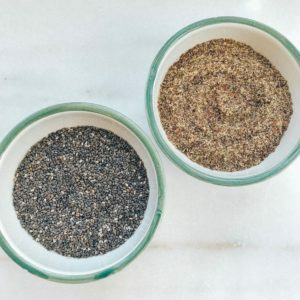 – Chia seeds/ground flaxseeds/hemp seeds: It’s important to include chia or flax seeds to absorb the liquid and thicken the consistency, which results in a more pudding-like texture. These little seeds pack in omega 3 fatty acids, fiber, and protein. They also help to lower cholesterol, slow the rise and fall of blood sugar and keep you feeling full longer. – Nut butter/sunflower butter: Nut butters make your creation even creamier and more savory. You can add them in before you put them in fridge or when you take them out. They contain heart healthy fats and protein. Fat also helps to slow the rise and fall of blood sugar and insulin levels – so they are a great add in for people with diabetes, insulin resistance or PCOS. Choose any nut butter (i.e. peanut, almond, cashew). Sunflower butter is a great option for anyone with a tree nut allergy. Tip: Be sure to check the labels on nut butters as they can be heavily processed! Try to look for labels that only contain one to two ingredients. -Sweeteners: You probably won’t even need a sweetener with all the delicious add-ins. But if you do, try small amount of fruit, honey, maple syrup, applesauce, 1/2 banana or any other sweetener of choice. Here is where the fun begins! Now that we’re done prepping our oats and they’ve been left for a good night sleep in the fridge, it’s time to take it out and top it off with all the goods. – Cacao nibs: These little nibs contain fiber, magnesium and antioxidants that are good for the heart as well as blood sugar management. Nutrition Facts (1 tbsp. ): 75 calories, 5 gm carbohydrates, 4.5 gm fiber, 2 gm protein. – Fruit: Fruit adds natural sweetness and is packed with vitamins, minerals, fiber and antioxidants. Limit dried fruit as it’s higher in calories and carbs. -Protein powder. If want to pump up the protein, add a scoop of your favorite protein powder, plain or flavored. Just adjust the liquid accordingly. 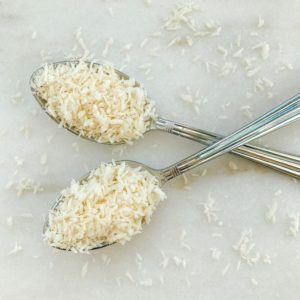 – Unsweetened shredded coconut/toasted coconut chips. Adding unsweetened shredded coconut or toasted coconut chips to your oatmeal adds a subtle buttery texture and a boost of flavor. Coconut is a great source of iron which is an immune booster that is crucial mineral for all the proper functioning of our cells! – Spices and other flavorings: Want even more variety? Add spices such as cinnamon, apple pie and pumpkin pie spice are savory can be a game changer in enhancing taste of your overnight oats. They also provide a variety of health benefits – from boosting immunity to helping control blood sugar. Or flavored extracts like maple or vanilla. My personal favorite spice is definitely cinnamon by a long shot! 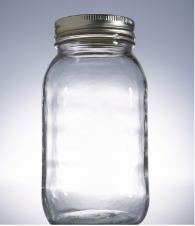 Step 1: Take a mason jar, glass, small bowl or even tupperware. Add ½ cup of the oats you choose as your base. Step 2: Add 1 tbsp. of chia seeds or flaxseed meal to the oats. After a few hours of adding the liquid in, the seeds will start to absorb the liquid making it extra creamy. It is also a great boost of fiber and protein. Step 3: Add ½ cup of your choice of liquid (if you want it creamier, add up to 1/3 cup of liquid, if you like your overnight oats very dense, add less liquid). Stir well! Step 4: Add any additional add-ins. I love adding nut butter into the base, it blends in really nicely and offers a boost of flavor and nuttiness to the mixture. Additionally, if you like it a little sweet, now would be a great time to add in – or you can save that as a topping! Step 5: Now that you have added everything to the base, securely cover your bowl/glass with a lid or plastic wrap and place it in the refrigerator (ideally overnight). Step 6: Take overnight oats out of fridge and add whatever toppings you want! You can eat it as is, heat it up, or bring it to work to eat later. You can also pop them in the fridge when you get to work. But not to worry if you do not have a fridge at work, I have kept my overnight oats in my bag for a couple of hours and they are still good! Please note that overnight oats are good in the fridge if properly sealed for up to 5 days, but they will develop a very soft consistency nearing the end of their shelf life. Oats are a healthy breakfasts option. Not only do they have numerous health benefits, but they are easy, versatile and fun the make! The flavor combos are endless. What are your favorite ways to make overnight oats? 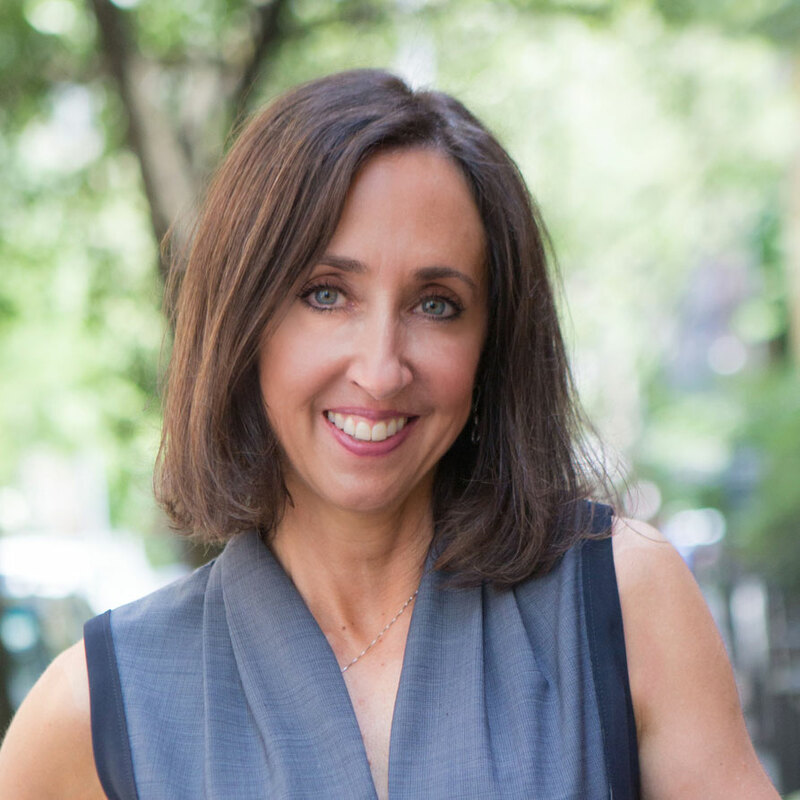 I’d like to thank Catherine Scott Fischer for writing this blog post. 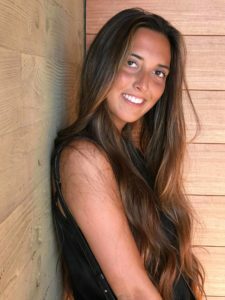 Catherine is a senior at New York University studying Nutrition and Dietetics. She was born and raised in Belgium and moved to the US when I was 18. This move coincided with a drastic change in her diet and she developed a passion for healthy, plant-based food! She has been vegetarian for 6 years and transitioned into a vegan lifestyle a year and a half ago. Catherine loves running, dancing and cooking! Stay tuned for more of her blog posts.